The rapper Dave says he's "just trying to focus on the positive" reaction to his latest track Black. The song - a raw and emotional piece about being young, black and British - has divided some audiences since it came out in February. DJs including Annie Mac and Greg James have defended it being played on Radio 1, after some people texted in saying it was "racist" against white people. "I'm just happy to be able to put out a message and affect people," says Dave. The 20-year-old tells Radio 1 Newsbeat that a lot of the reaction to the song has "been really positive". The Funky Friday rapper adds: "If they take to it then they do - if they don't, then it's like that with all of my music. "People have been doing it before me. 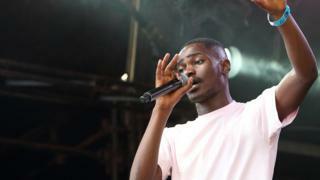 People will continue to be doing it after me," he says, mentioning the likes of Bashy, Akala, Ghetts and Kojey Radical. The video for the song features prominent black Brits such as Stormzy, Raheem Sterling and fashion designer Ozwald Boateng. It's had more than 1.5 million views on YouTube so far, and features lyrics such as "A kid dies, the blacker the killer, the sweeter the news/And if he's white you give him a chance, he's ill and confused". Another line is: "Black is so confusin', 'cause the culture? They're in love with it/They take our features when they want and have their fun with it." Also in the video is British champion sprinter Dina Asher-Smith. "Being recognised in the climate of general success for the young black British population makes me very proud," she tells Newsbeat. Dina appears in the video in a shot alongside Dave, wearing her three gold medals from the 2018 European Championships. In another section, she's seen alongside Radio 1 and 1Xtra DJ Tiffany Calver and mathematician Dr Anne-Marie Imafidon MBE. The lyric playing at that moment is: "Tell us we used to be barbaric, we had actual queens." "Just to be recognised alongside such powerful and influential women in that particular shot means so much to me," Dina says. "It makes me proud to be part of a community that is really pushing boundaries and inspiring each other." Radio 1 DJ Annie Mac tweeted that there are "so many negative comments from listeners" whenever she plays the song. She pleaded with people to "listen to the song with open ears". Some who have called the song racist said that Radio 1 wouldn't play the song if it was called "White". Greg James also addressed the backlash on the breakfast show. He said: "If you've got a problem with the content of the Dave track, the problem is with you, and you need to go and read up and educate yourself a bit." "Nothing's changed with me," Dave tells Newsbeat. "I'm not the first person to speak about where I'm from or what I represent. "How people take music [now] is how they took it before and how they take it 10 years from now."